This month, EVERYTHING YOU KNOW ABOUT SPRINGFIELD IS WRONG! Mayor Marge Bouvier-Ziff. Homer Simpson, hitman. Milhouse Van Houten, overachiever-rebel. Principal Bob Terwilliger. WHAT THE HECK IS GOING ON?? 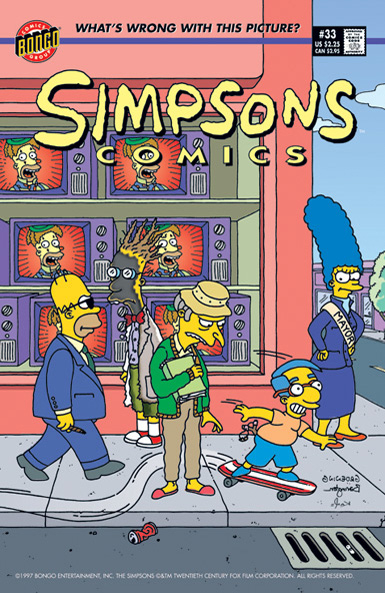 The answer: Professor Frink is on the brink and he's managed to put reality on the blink! See Springfield as you've never seen if before--IN A TIME/SPACE TIZZY! But can Frink put the pieces back together before Mayor Marge, hitman Homer, Principal Terwilliger, and Old Man Burns close in on this new, machiavellian Milhouse? And how do Bart and Lisa fit into it all? Wait and see the flux take flight as Frink struggles to set things right!